It’s mid-morning as I sit in a coffee shop on Nathan Rd in the heart of the golden mile during the last day of a 3-day stopover from NZ. A young woman wearing the latest western designer clothes strolls purposefully down the road. As she passes the coffee shop, she side-steps a tiny old woman, who is bent almost double, pushing a cartload of goods slowly down the street. The young woman barely sees her; she is talking on her mobile phone. Seconds later she glances at her brand-name watch before disappearing down into the Shah Tsim Shiu station of the MTR. 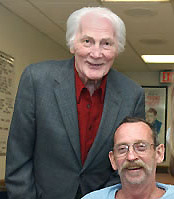 Was sorry to read in the news today about the death of Jack Palance. Few actors of his caliber ever graced the silver screen – especially in the western genre and his portrayal of a long string of tough guys was difficult to match (perhaps only Lee Marvin and Clint Eastwood come close and neither was as good as Jack at playing the villain). Welcome news about the US mid-term elections which saw a massive protest vote turn the tide significantly against Dubya and his cronies. Although Dubya can still use his presidential veto to override the will of Congress, it will at least mean that the White House won’t be able to get a republican controlled congress to rubber-stamp everything that comes down the line. Isn’t it nice to have something in politics to smile about at times?